By Emer Ingoldsby | May 10, 2013. Over 10,000 people have submitted suggestions on the naming of Dublin’s latest bridge. Dublin City Council confirmed this number, which showed the enthusiasm of Dublin residents towards the new bridge, which is situated between Marlborough Street and Dawson Street. The council’s Commemorative Naming Committee hope to have a recommendation ready for a city councillors’ vote in mid-July. Suggested names reflect many popular figures including scientist Earnest Walton; activist and trade unionist Rosie Hackett, who was involved in the 1913 Lockout and 1916 Rising; and writer Maeve Binchy. A campaign organised by the Abbey Theatre group gathered 2,300 votes to name the bridge The Abbey Bridge, whilst GAA supporters voted to honour 15-times All-Ireland camogie champion Kay Mills. 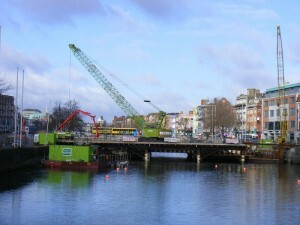 The three most recent bridges were named after Samuel Beckett, Seán O’Casey and James Joyce. Just two of the 23 bridges over the Liffey have female names – Sarah’s bridge at Islandbridge and the Anna Livia bridge at Lucan. He also said that the committee would prefer to honour someone who was deceased for at least 20 years. However, O’Connell Bridge street trader Philip Killeen believes that Maeve Binchy’s name should be seriously considered. “She was one of Ireland’s true talents, for other reasons besides nationalism. We shouldn’t have to wait years after her death to acknowledge one of Dublin’s legends,” he said. The deadline for public suggestions closed on Friday 19 April, with Charlie Haughey, Phil Lynott, Bram Stoker and James Connolly also in the mix. On completion the new bridge, funded by the Department of Transport, Tourism and Sport, will provide a thoroughfare over the Liffey for buses, Luas, cyclists and pedestrians.